How exactly does atherosclerosis result in a heart attack? The Department of Cardiology, National Heart Centre Singapore (NHCS) shares. is the silent, stealthy hardening of arteries. Over time, it can cause a heart attack. Thirty years ago, Mr S was a heavy smoker who often stayed out late with his friends, eating and drinking. But in 1990, when he was 39, he made a life-changing decision out of love for his family – he gave up smoking and started taking care of his diet. “I was motivated to change my life when I realised how unhealthy my habits were and that my family was worried about me,” the 62-year-old said. His lifestyle was worrying his wife and preventing him from spending quality time with his young daughter. Little did he know that the move possibly saved his life. His general health improved steadily with the change, but three years after giving up smoking, he still suffered a heart attack – his first. An angioplasty was done to clear blockages in his arteries. Since then, he has suffered two more heart attacks – in 1996 and 2013 – and undergone multiple angioplasties and a heart bypass. Mr S suffers from atherosclerosis, a disease where the inside of the arteries are blocked by plaque. When the plaque breaks away, it can form blood clots that cause heart attacks. Dr Aaron Wong, Head and Senior Consultant, Department of Cardiology, National Heart Centre Singapore (NHCS), a member of the SingHealth group, who treated Mr S, said the lifestyle changes Mr S made most likely reduced the severity of his condition, but unfortunately did not prevent the heart attacks. Atherosclerosis: How exactly does it happen? Atherosclerosis – commonly known as the hardening of the arteries – is still something of a mystery. Exact causes are unknown but doctors say that unhealthy habits, such as heavy smoking and a fatty diet, greatly increase a person’s risk of developing it. “When plaque builds up in an artery, it narrows the artery and reduces blood flow,” said Dr Wong. Plaque builds up when cholesterol, white blood cells, calcium and other substances accumulate on an artery wall. In time, the plaque could break off, causing a blood clot. If the clot is large enough, it can block blood flow through a coronary artery and cause a heart attack. Dr Wong said that the narrowing of the arteries can affect the body in a spectrum of ways. For a start, the narrowing can be so gradual that the body’s natural compensation mechanism causes small capillaries to form, bridging the blockage before the artery is completely blocked. This “natural bypass” prevents patients from having a heart attack even though an artery may be 100 per cent blocked. 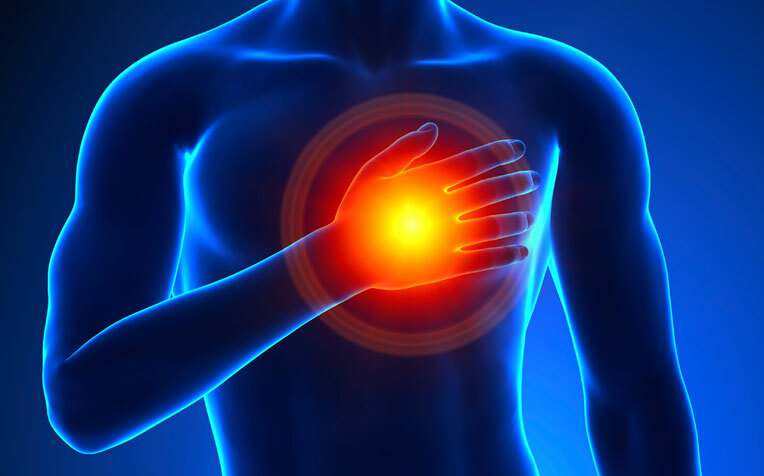 However, the patient may have angina – the feeling of pain or tightness in his chest during physical exertion – with the pain typically going away when he stops to rest. When the plaque build-up in the artery suddenly ruptures, platelets in the blood will rapidly cover up the rupture, leading to a clot forming, which narrows the artery further. If blood flow is completely blocked, the affected muscle loses its oxygen supply and a heart attack occurs. If the blockage is not opened within 12 hours, the muscle supplied by that artery will be irreversibly damaged. Depending on its severity, a heart attack could lead to death. Patients with atherosclerosis may show no symptoms for decades, until a sudden heart attack occurs. Read on for risk factors and treatment options for atherosclerosis. ​What Puts​​ You At Risk of Coronary Heart Disease?